Be an advocate for the employers, using our experience to represent their interests to the healthcare marketplace ethically and aggressively. 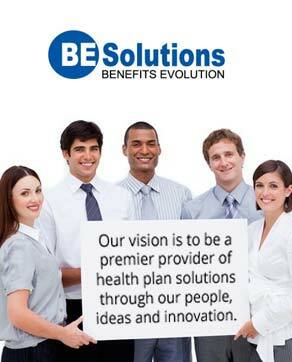 Our vision is to be a premier provider of health plan solutions through our people, ideas and innovation. We will form partnerships with our employers, plan members, providers and insurers to implement health plans from which everyone benefits and affording the best chance to effectively manage and control costs. We will grow our business through satisfied customers sharing their experience with others. Being an advocate means always working towards the best interest of the client. This does not always mean the cheapest option. This does not always mean using a particular company. This means that we MUST understand the needs of the employer, be able to present those needs clearly and use ALL of our resources in an effort to achieve a solution that meets those needs. Though we represent the employer as our main client, we must approach all this professionally, honestly and ethically so as to maintain the respect of the payers, the providers and the competition. Empower the employers to recognize the benefit needs of their employees, to manage benefits and to control cost. Though we represent the employer as our main client, we MUST learn from the employees and plan members. What are the issues that arise in the plan? What would the members like to see changed, either added or removed from the plan, knowing that many times the interests of the employer and the plan members will clash. Knowing this information, we can use our resources and expertise to advise and consult the two parties on a path that makes sense for the long term success of the plan. Success will be defined as acceptable coverage at an acceptable cost. Be a source of service and support to the members of our plans, representing their issues and concerns to the providers and insurance companies. Again, we MUST monitor the issues and concerns that arise in the daily utilization of the plan. Our goal WILL BE to handle all service issues in a timely manner. We want to track this progress with a proactive reach out, either call or email, no later than 3 days from the initial call from the member. We WILL schedule this reach out with the member prior to ending the initial call. If a pattern or reoccurring issue is identified, we will identify it and work with everyone involved to offer a solution. It could be a utilization issue, a provider issue, an insurance company issue or a plan design issue. Find the solution and communicate it to the employer and members. Educate employees and their families to become consumers of healthcare, to understand and appreciate their benefits and to embrace wellness opportunities. Be respected by the marketplace for professionalism, treating insurers fairly and paying providers accurately and in a timely manner. Entrust to BE Solutions employees the ability to contribute to the direction of the company, providing an environment conducive to professional growth and personal satisfaction.